Is Bench Bookkeeping Right for You? Bench is a popular online bookkeeping service that works with clients around the U.S., just like us. We often have potential clients call us and ask, “What is the difference between Bench and Accountingprose?” or “Why should I choose Accountingprose vs. Bench for my small business?” While on the outside our services may appear to be the same, there are a few key differences in our service offering that may help you make the choice that is right for you. What Services Does Bench Provide? Bench provides cash basis bookkeeping services that include receipt management, transactions classification, and financial statement prep. In order to do their work, they ask you for read-only access to your accounts or account statements; something we also do. Cash Basis accounting will work for some businesses, but before you decide to go this route, you should understand what Cash Basis Accounting means. Cash Basis accounting is a method of recording accounting transactions as they come through your bank account. So, any time money comes in your income is recorded. Any time money goes out, your expenses are recorded. A good way to think of Bench’s service offering is to look at it as a basic checkbook reconciliation. Money moving in and out of your bank account will get entered on the date they clear your account. What sort of items do not get entered in your checkbook? Accounts Payable: Bills to be paid will not be entered into Bench, so you will not be able to track who you need to pay and when. If you do not track bills to be paid, have most of your vendors on auto-pay, or write checks/pay cash on the fly, this shouldn’t be a concern for you. Accounts Receivable: Do you bill your clients and allow them to pay at a later date (eg: Net 15, Net 30)? If so, you have Accounts Receivable. Invoices will not be tracked in Bench, so you will not know who owes you money within their software. If you are a cash based business, like a fast casual restaurant or service business, you may not track Accounts Receivable and this may not be a limiting factor. Prepaid Expenses: Have you ever paid for an insurance policy in one lump sum? Do you ever pay for a yearly software subscription to take advantage of the discount? If so, you have Prepaid Expenses to track. Bench will track the payment to the vendor in the month it passed through the account, not on a monthly basis, which is the correct way to treat the transaction. Unearned Revenue: Unearned Revenue is essentially the opposite of a Prepaid Expense. With Bench, If you invoice a client up front for services not yet rendered, the entire deposit will be booked to income. While this gets the income on the books, it isn’t accurate because it isn’t in the right period. Inventory: Do you operate a brick and mortar or e-Commerce store? If you purchase inventory for your store, this will be booked as Cost of Goods Sold as soon as you purchase the items if you use Bench. This inflates the cost in the month it was purchased, and doesn’t give an accurate picture of what is actually sitting on your shelf. You won’t be able to analyze the time it takes to move product, see the true cost to sell your products, or see the value of your inventory- important metrics retailers should be tracking. 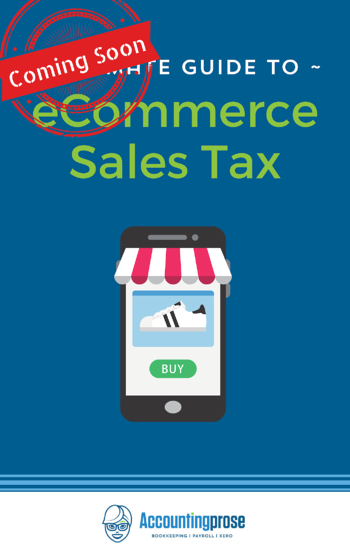 Sales Tax: If you run a brick and mortar store or an e-Commerce business, you will need to track your Sales Tax Liability. As you may know, Sales Tax is not an expense to the business. If you track the payment made for Sales Tax, but not the Liability, your Balance Sheet may show Sales Tax as a negative, or an overpayment. The proper way to handle this is to enter the Sales Tax as it accrues, and pay it down at the end of each reporting period. What other accounting functionality is Bench missing? 1099s: Do you pay contractors, rent, or an attorney? You likely need to send out 1099s at the end of the year. While we will collect W9s from your contractors and send out forms at the end of the year, Bench will not. Segregated Income by Profit Center: Do you track multiple streams of revenue and their related costs? Bench doesn’t track income and Cost of Goods Sold/Cost of Sales in great detail, leaving you without the ability to track Gross Profit Margin by profit center. We dive into your processes and systems, tease out this information, and make sure that your financials accurately reflect your unique business. Job Costing: Do you track income and expenses by customer or by project? You will not be able to drill down and see how profitable your jobs or customers are in Bench as this information is not captured. We think job costing is essential to running a small business. You absolutely need to know if your jobs are making or losing you money. Billable Expenses: Do you pay for expenses on behalf of your client, to be billed back later? Bench does not track this information, nor give you the ability to create Invoices (Accounts Receivable) to your clients. We don't think you should track this information outside of your accounting file, on messy spreadsheets. This should live in your accounting file, so nothing is missed. Payroll: Do you pay employees or contractors through payroll? You can only track the payments for payroll and contract work, not schedule payments, file quarterly and end of year forms, and pay payroll tax. We manage our clients' payroll, end to end because we know just how important getting your employees paid and your tax filings in on time is. What type of Financial Statements does Bench provide? Bench offers a Profit and Loss (aka Income Statement) and a Balance Sheet on a cash basis. Your Profit and Loss shows you the income and expenses for a period- which can be a day, a month, a year, etc. Your Balance Sheet is a snapshot of the financial position of your business in a point of time. On your Balance Sheet, you can see your assets (what you own), liabilities (what you owe), and equity (your stake in the business). Cash Basis financials really only show a part of your financial picture and may not give you the depth that you need. They may lack the ability to analyze your business performance by looking at complete month-over-month financials, allow you to budget accurately, project forward, know who you need to pay and when, and know who owes you money and when their bills are coming due. Furthermore, if you want to track your budget, drill down to see profitability by job or customer, you won’t be able to do this in Bench. Essentially, financials drafted by Bench are good to send to your CPA at the end of the year to prep your taxes. You may need to provide additional detail to your CPA, but they will a good conversation starter. Can you convert a Quickbooks Online, Quickbooks Desktop, or Xero to Bench? Yes and no. When you get started, Bench will ask you for your last set of completed financial statements. They will enter this summary information in, but none of the detail. You cannot import Quickbooks Online, Quickbooks Desktop, or Xero into Bench. So, if you are a business with a lot of transaction history, you may lose crucial detail in the switch. Be sure to download a full transaction list plus monthly financials to keep on file in case of an audit. What if you have no history to track? Bench can likely get you set up and start at a point in time, allowing you to skip entry of historical data. What if you want to go back and rebuild prior year accounting history? Bench can do this, for a fee. Sadly, we do not have any information on their fee structure for historical accounting. How easy is it to move off of Bench Accounting? Bench is a proprietary accounting software which does not provide an export that is compatible with major accounting software (Intuit or Xero). Should you decide to move from Bench into another accounting platform or to another provider, they will need to either rebuild your file or enter summary information month over month, so that you can budget and project forward. We have worked with many clients who have switched from Bench to Xero. While we did have to go back and recreate our clients' accounting file, this didn't overburden us with work and we didn't have to stress our clients with additional cost. Thankfully Xero has cash coding, which allows us to enter transactions in bulk- saving us time and effort. Win/Win. Bench clearly defines their pricing on their website, which starts at $135 per month and climbs to $470 per month. Their packages only cover receipt management and account reconciliation. You will need to handle any other accounting, tax, and admin tasks on your own. Who is Bench right for? Just like Accountingprose is well-suited for a specific audience, so is Bench. Bench should able to serve Freelancers and Micro Businesses well. 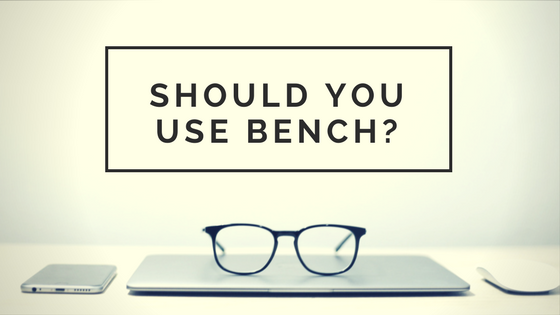 If you need a basic, no frills bookkeeping company- Bench may be the right fit for you. What are the Alternatives to Bench? DIY- QBO, QBD, Xero: These options can be a good choice, but should only be used as a stop-gap. Want to learn how to "do the books" and keep the budget tight? Be your own bookkeeper until you can afford to offload this responsibility. Your time is better spent working on the business, vs. in the business. Freelance Bookkeeper: Freelancers are great, because they are often less expensive than a bookkeeping company or CPA and have the skills to pay the bills. :) One downfall of hiring a freelancer is that their time is often limited, as they are just one person. They can only take on a limited number of clients, or else they may feel overwhelmed and some details may slip through the cracks. Also, if they go on vacation, your accounting goes on vacation. CPA: CPAs often take on bookkeeping clients to keep all of the work in-house and to generate revenue outside of tax season. They tend to charge a higher rate than a freelance accountant, which is hard for a small business owner to work with. We love working with CPAs who manage the tax work, while we take care of the day-to-day. Bookkeeping Company: This is us! We are typically more expensive than a freelance bookkeeper, but less expensive than a CPA. We hire awesome accountants who we treat like gold and who are excited to work with you. We offer a more comprehensive accounting service than Bench, handling the nitty gritty and not just basic account reconciliations. We will file and pay your sales tax, gather W-9s, issue 1099s and W-2s, produce job costing reports, create and track budgets, recommend and implement software, work with you to develop visual systems and processes, provide the accounting and document management software (which is transferrable at any time), provide advisory services, deliver eloquent financial dashboards paired with industry specific KPIs, and work with your CPA at the end of the year (just to name a few things). We work our butts off, so that you can sleep better at night knowing that no stone is left unturned. Want to learn more about Accountingprose vs. Bench Bookkeeping? Set up a time to chat and we can walk through your specific use case and determine if we are a good fit. If not, we are happy to make a recommendation for someone who will take care of you.